this page usually links to "Vacation Rentals" but "Vacation Rentals" now links to /vacation-rentals-homes.asp?cat=8241. design request made by Steve Dec 8 2015.
if new categories are needed, undo design change and resume with default. Little Basin Villas in Islamorada offers these 9 beautiful vacation villas, located in the Art District near Mile Marker 81.8. Your family and friends will enjoy the shared bayside boat dock and boat ramp, along with the community swimming pool, and proximity to the best and most popular restaurants. Each of our Islamorada vacation rentals comes fully equipped and furnished for a stay of one (1) week or more. Enjoy this lush tropical setting and the sports fishing capital of the world from the vantage of one of these lovely vacation rentals. Choose from bayside, bayview and parkview villas. Escape to your own Bayview Vacation Villa in Islamorada. We offer brand new 3 bedroom, 3.5 bathroom villas in the Islamorada Art District on the Florida Bay. These Bayside villa rentals are located closest to the pool, dock and fresh, clear bay waters. The villas are very near our iconic marinas and restaurants too. Includes master bedroom with king bed, patio balcony and private bathroom. The second bedroom also has king bed and the third bedroom has a queen bed, both with a private bathroom. You will be pleased with the spacious living room, and HD flat screen TVs in each bedroom. Gourmet kitchens are fully equipped and washers/dryers are in each private villa with ceiling fans throughout. The community pool and Tiki Hut with BBQ grill are steps outside the door. These Islamorada vacation rentals have shared dockage for up to five 16-20 foot boats in addition to a boat ramp with steps for launching kayaks and paddle boards. Stays of one (1) week or more. Have fun! Adventures await in your exclusive Islamorada Villa on the Florida Bay. These vacation villas are located in the Islamorada Art District, and are newly built, with 3 bedrooms and 3.5 bathrooms. The Conch Villas have the best of all worlds, including a scenic view of the bay, the pool and the green lushness of the park next door. These brand new luxury vacation villas are near marinas and restaurants. The master bedroom has a king bed, patio balcony and private bathroom. The second bedroom also has a king bed and the third bedroom has a queen bed both with private bathrooms. You will be pleased to find that the living room and bedrooms all come with HD flat screen smart TVs. Gourmet kitchens are fully equipped. Washers/dryers are in each private Villa with ceiling fans throughout. The community pool and Tiki Hut with BBQ grill are steps outside the door. There is a shared dock for up to five 16-20 boats in addition to a boat ramp with steps for launching kayaks and paddle boards. Stays of one (1) week or more. Have fun! 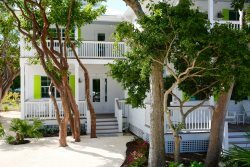 Step into the casual elegance of our Key Lime Villas here in Islamorada. Each of these vacation villas has complete access to the dock and pool, and also overlooks the Islamorada Park and community beach next door. These brand new 3 bedroom, 3.5 bathroom villas are located in the Islamorada Art District along the Florida Bay. The villas are delightfully decorated vacation rentals, and are near our iconic marinas and famous local restaurants. Little Basin Villas also has shared dockage for up to five 16-20 foot boats in addition to a boat ramp with steps for launching kayaks and paddle boards. These are the perfect getaway for families, friends and small groups. Each newly built villa offers a master bedroom with patio balcony, king size bed and private bathroom. The second upstairs bedroom also has a king bed and private bathroom, and the third bedroom on first floor has a queen bed and private bathroom. The living room and bedrooms all come with HD flat screen smart TVs. The gourmet kitchens are fully equipped and washers/dryers are in each private villa. The community pool and Tiki Hut with BBQ grill are steps outside the door. Stays of one (1) week or more.